This post is a little off the regular track of postings here, but it’s entirely necessary that I cover it. The email came from a group called the US Commerce Association and they claimed that our restaurant was top in its category for our town. Along with recognition of our achievement in a press release, they wanted to send us a crystal award with the name of our restaurant etched into it. To be honest, I was extremely excited while reading the email. The award looks really nice and the email was very flattering. That excitement quickly washed away when I actually took the time to carefully reread the email. Not only did they not have the right city of our restaurant, but they also spelled THE NAME of the restaurant wrong. And then, I clicked through to the website, where they wanted us to pay $179.99 plus an additional $20 in handling costs. It became pretty clear that this whole was just to get me to buy a plaque. You’ve won Steve’s Award of Excellence! You’re in shock, I know, but it’s true! In recognition of your achievement, I’ve created this lovely plaque for you to put on display. This is a very prestigious award that not just anyone can receive. In fact, I rarely give these away. However, one look at you and I knew in my heart that you were a winner and now you can prove it to all of your friends with this lovely plaque! Best of all, the award is FREE! All you need to do is pay $79 in shipping costs, plus an additional $20 handling fee and that’s it!!! Act now and claim your award before I select someone else! And I think I prove my point. On an entirely serious note, I’ll mail the above award complete with confetti to the first person to send their name and address to Steve@IveTriedThat.com. Really. I spent a lot of time making that award and I’d hate to just throw it out. Yeap… we received it today (03/22/12) here in Maryland… I guess I’ll stick with Steve’s ones… when can I expect to receive it??? Hi Jeannie, they must be gearing up – we got it today here in NYC. Thanks Steve; I just got the email that I had won too. I appreciate the time you’ve save me from researching the organization. OMG! 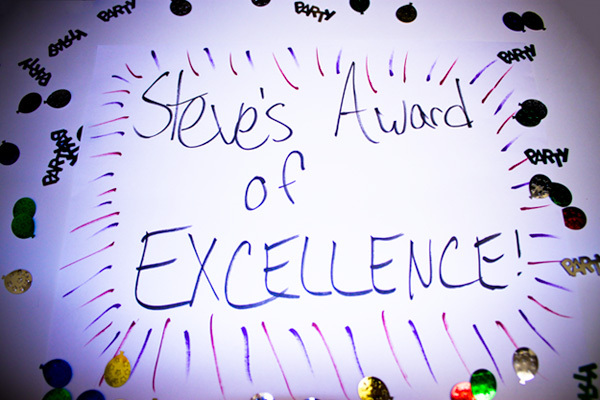 I can’t believe I’ve won Steve’s Award of Excellence! I’m going to put this in the lobby. Where do I send my check for $99? Wow Steve, thanks for the write up about the US Commerce Association plaque giveaway. A free plaque for only $179 plus shipping! It gave me a great idea, though, I think I’ll just make my own trophy and give it to myself. I could order one on a discount website… Maybe I’ll start a club so everyone can recognize everyone else, then just buy their own awards. Omigod, We want our plaque! We are so happy to have finally won something. We never win anything…..
After further research, I’m going to sidestep this potential ‘opportunity.’ There’s too much negative publicity about this organization, and the scam risk is too high to associate it with our company. We’re going to pass, and I’d advise every else to do so as well. My company received this award too. I’m not going to buy anything, but I may use the free press release they sent me on our social networks. It’s FREE publicity, so where’s the risk? The only caveat is if this organization is a complete joke. I’ll do more research. Because honestly, there are MANY groups (and awards) just like this one in the market. Some of these awards are even coveted by industry leaders…with the dirty little secret that one way or another, the company actually PAYS to receive the award. So yeah, I may or may not use the free press release they sent me. But I definitely won’t buy anything. Thanks for posting and saving me the hassle of dealing with them. Well surprisingly, (not surprisingly?) no one took me up on the offer for the free award yet. Just think, Steve, you could be rich with that sales pitch and people really would buy it. Which is unfortunate. Thanks for your blogs.